It wasn't until we reached the deck on the outside of the bar, that we realized what a very scenic place Captain's Cove is and was very impressed. They also have a place for buying marine equipment. 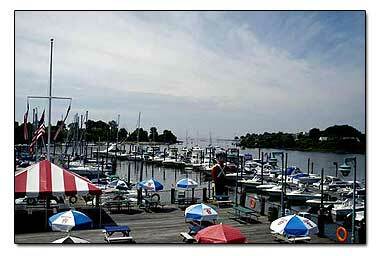 The history of Captain's Cove Marina is displayed in pictures and information on a wall inside the restaurant. We read about 5 minutes worth and here it is in a nutshell. The area was an old dock and not much going on but fishing. When it acquired new owners, they magically turned it into one of the best places to visit in Bridgeport. They said when it first opened in 1986, they actually took a boat out to the Black Rock Cove inlet to greet other boaters, and to invite them to come in. I guess what they would call this spot is a Dock and Dine. Located at 1 Bostwick Ave. 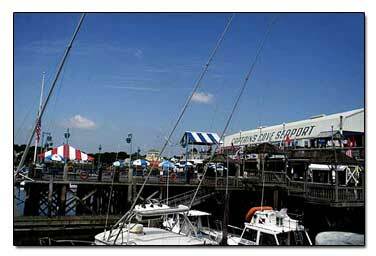 The directions to Captain's Cove Seaport are simple. On I-95 from north or south, Exit 26 to Bostwick Ave. following Captain Cove's well placed signs. Captain's Cove is also close to the Ferry Memorial Seaside Arch and the Bridgeport lighthouse, so you could visit there too.